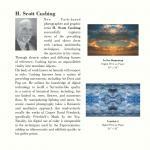 Scott Cushing is an award winning, published photographer and graphic artist. Many of his designs have been reproduced for the gift industry and sold in national retail stores. His work has been featured at Agora Galleries in Chelsea, Lincoln Center NYC, Gracie Square NYC, Columbus Avenue NYC, Mystic Seaport and Westport Conn. juried art shows. 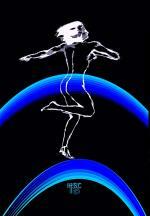 In all he has shown in more than 25 high profile juried art & photography shows. Inspired by Surrealists and Existentialism his work is a multi-media effort that brings together photography, graphic arts and original digital techniques. 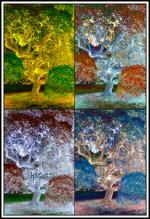 These works can be found on Art-mine.com and other internet Galleries and Fine Art exhibits. and a more surreal sense of pattern and repetition. products as much as natural phenomena. aesthetic beauty and formal audacity. spaces with no up or down, but possessing astounding visual power. pure spaces independent of figures or settings, with infinite potential. New York-based photographer and graphic artist H. Scott Cushing successfully captures views of the prevailing world and skews them with various multimedia techniques, introducing the spectator to his vision. Through electric colors and differing frames of reference, Cushing injects an unparalleled vitality into mundane objects. 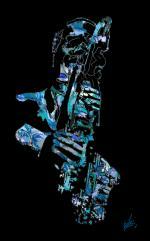 3rd Ward is a member-based art and design center for creative professionals in New York City. Committed to providing resources, opportunities and a dynamic-creative network, our space houses four gorgeous photo studios, a professional wood & metal shop, a fully loaded digital media lab, shared & private work space and a large selection of interdisciplinary art classes. This is your home for creativity. We strive to enhance people's lives and careers by giving them new ways of problem-solving in this changing world. We recognize that ideas matter and support creative endeavors that empower our members, students, and community. The Brooklyn-born, Long Island-based artist H. Scott Cushing finds images in the sky. Though trained as a photographer, snapping a shot is only the first step in his unique, multidisciplinary process, which also incorporates graphic arts and digital manipulation. He starts by taking spectacular photographs of clouds, either at sunset, on crisp, clear blue days or under menacing, overcast skies. 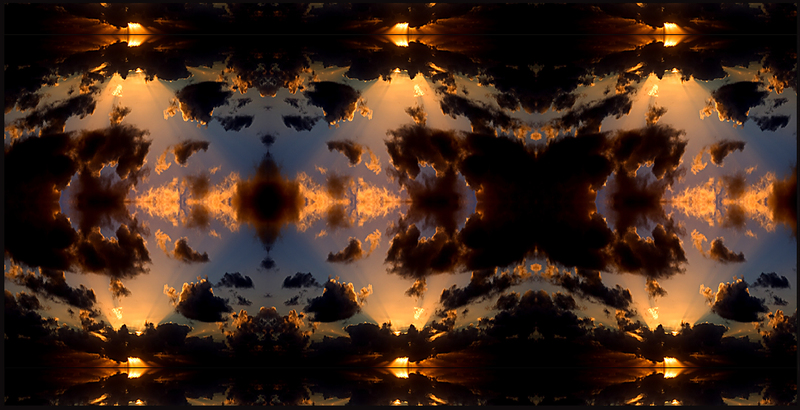 He then applies various mirroring effects that turn those stunning cloudscapes into Rorschach-like abstract patterns within which Cushing sometimes embeds digital, drawing-like human figures. These additional features disrupt the patterns of repetition, injecting surreal and surprising elements into the creation. He cites the importance of existentialism in his work, which comes across with superb visual force both in the fragile outlines of those human figures, but also in the quasi-Biblical immensity of the skies he shoots and refracts. H. Scott Cushing�s combinations of celestial and human images elicit innumerable emotional impressions, from melancholy and self-reflection to rapturous optimism. Manhattan, New York, United States of America The Brooklyn-born, Chareston, SC-based artist H. Scott Cushing finds images in the sky. Though trained as a photographer, snapping a shot is only the first step in his unique, multidisciplinary process, which also incorporates graphic arts and digital manipulation. He starts by taking spectacular photographs of clouds, either at sunset, on crisp, clear blue days or under menacing, overcast skies. He then applies various mirroring effects that turn those stunning cloudscapes into Rorschach-like abstract patterns within which Cushing sometimes embeds digital, drawing-like human figures. These additional features disrupt the patterns of repetition, injecting surreal and surprising elements into the creation. He cites the importance of existentialism in his work, which comes across with superb visual force both in the fragile outlines of those human figures, but also in the quasi-Biblical immensity of the skies he shoots and refracts. 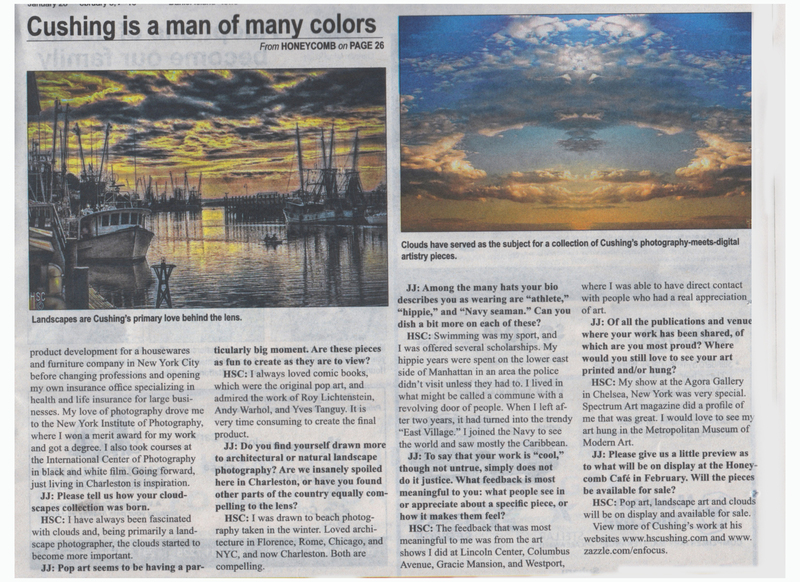 The Brooklyn-born,Charleston, SC-based artist H. Scott Cushing finds images in the sky. Though trained as a photographer, snapping a shot is only the first step in his unique, multidisciplinary process, which also incorporates graphic arts and digital manipulation. He starts by taking spectacular photographs of clouds, either at sunset, on crisp, clear blue days or under menacing, overcast skies. He then applies various mirroring effects that turn those stunning cloudscapes into Rorschach-like abstract patterns within which Cushing sometimes embeds digital, drawing-like human figures. These additional features disrupt the patterns of repetition, injecting surreal and surprising elements into the creation. He cites the importance of existentialism in his work, which comes across with superb visual force both in the fragile outlines of those human figures, but also in the quasi-Biblical immensity of the skies he shoots and refracts.